Refrigerated biscuits make this sticky, sweet pumpkin monkey bread irresistible and so simple to make. Let it cool and drizzle with maple glaze, and enjoy the taste of fall. We love desserts that are full of fall flavors like Apple Pie Dessert Crepes and Pumpkin Crème Brûlée. Monkey Bread, also known as Pull-Apart Bread, is not only sinfully delicious for breakfast or dessert, it’s also fun to eat. This recipe is all gussied up for autumn with pumpkin, fall spices, and a sweet maple glaze. There has been nothing better than this incredible pull apart bread to come out my oven lately, and that’s no lie! 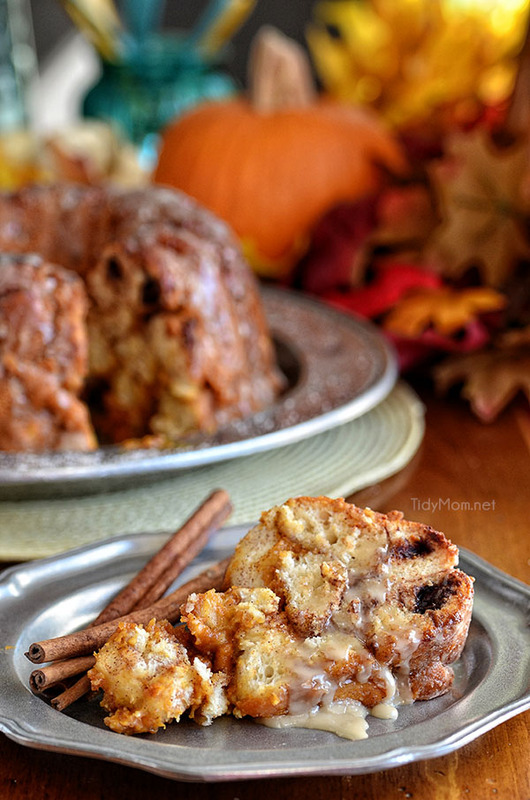 Pumpkin Monkey Bread….. Rocked.My.House! I made it one day and we ate it for dessert that night, and then we devoured the rest of it the next morning for breakfast. Fluffy, soft and doughy sections of biscuit dough coated in cinnamon-sugar and cozied up with pumpkin cheesecake and a hint of chocolate! Um, yes, please! Drizzled with a decadent maple glaze that seeps into every little crevice and makes every bite melt-in-your-mouth amazing…… just how you would imagine fall would taste. 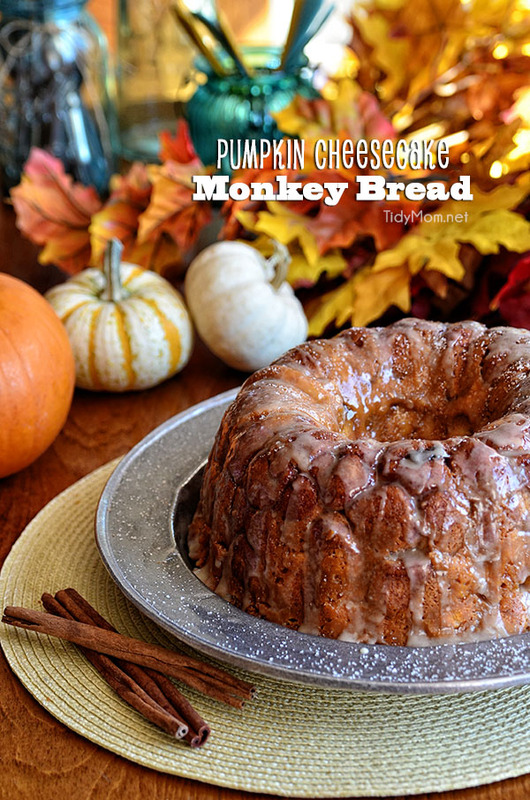 HOW DO YOU MAKE PUMPKIN MONKEY BREAD? Here’s how it goes down: You simply start with refrigerated biscuits cut into quarters and rolled into balls, roll half of them around a chocolate chunk. Stack dough balls together in a bundt pan piece by piece and cover in a pumpkin cheesecake filling and bake. 30-40 minutes later you come to the realization that this monkey bread is the only thing you need to be deliriously happy for the rest of your life. Each fluffy piece is prime for popping right into your mouth. Full of all your favorite things about fall baked into a single, beautiful creation. Happiness, guaranteed. 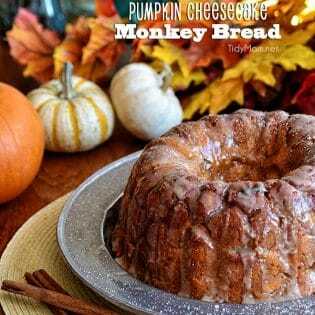 You absolutely HAVE to give this pumpkin monkey bread recipe a try! 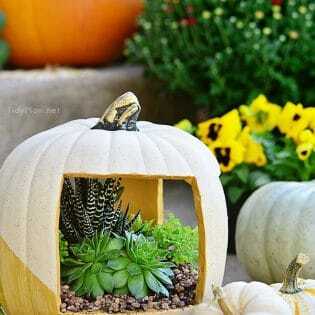 It is so simple to make and will become a fall staple in your home! 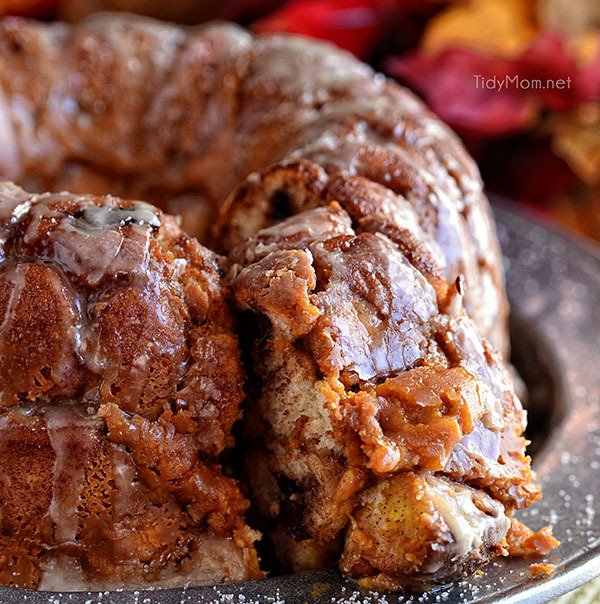 LIKE THIS PUMPKIN MONKEY BREAD RECIPE? PIN IT! Heat oven to 350°F. Spray 6-cup fluted tube cake pan with cooking spray. In large plastic zip top bag, mix granulated sugar and pumpkin pie spice and set aside. In 1-quart saucepan, heat brown sugar, butter, pumpkin and cream cheese over medium heat, stirring occasionally, until butter is melted. Beat mixture with whisk until mostly smooth (its okay if there are some tiny pieces of cream cheese that remain). Separate 1 can of dough into 10 biscuits. Cut each biscuit into quarters (tip: you can stack 3 biscuits together, cut stack into quarters and separate pieces). Place a piece of chocolate in center of each dough quarter and press dough into a ball covering chocolate chunk. Place biscuit pieces into sugar bag and shake to coat. When pieces are coated, arrange in pan. Open second can of biscuits, cut into quarters, roll into balls (without chocolate). Place biscuit pieces into bag and shake to coat and arrange in pan with chocolate stuffed dough balls. Pour half of pumpkin mixture over biscuit pieces in pan. Cut and roll remaining 2 cans of biscuits as before and arrange in pan. Pour remaining pumpkin mixture over biscuit pieces. Place pan on cookie sheet to catch any spills. In a medium bowl mix powdered sugar, maple syrup, vanilla and one tablespoon of milk. Stir to combine and desired consistency. Add more milk if need. Place heatproof plate upside down over pan; turn plate and pan over. Remove pan. Cool 10 to 15 minutes, drizzle with glaze and serve warm. Store in refrigerator. The name alone sounds amazing! This monkey bread looks craaaaazy good! My taste buds just exploded off my head. 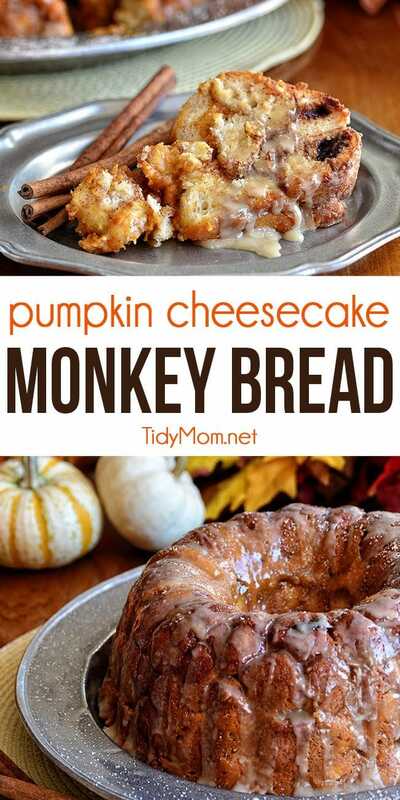 Pumpkin, Cheesecake and monkey bread in the same sentence? This is my new favorite thing of all the things. Looks delicious Cheryl! Pinned! Monkey bread is the best! You made it even better by adding in chocolate and pumpkin! That is probably the best looking pumpkin monkey bread I’ve ever seen! Definitely need to give this one a try. Oh my stars – the hubs will be begging for this. Everything awesome rolled into one recipe – thanks Cheryl! Have a great weekend! Can this be made the night before ? Or something along this line ! 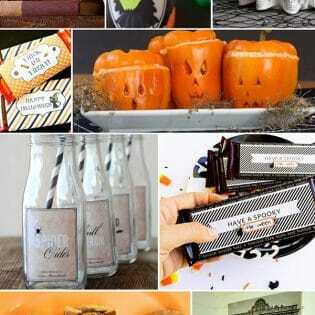 Where can I find a cup of pumpkin?